It is interesting to see how companies with deteriorating fundamentals are using Hurricane Sandy as an excuse for their weak performance. Rite Aid (RAD) happens to be one of those firms. BusinessWire: - For the five weeks ended Dec. 1, 2012, same store sales decreased 3.0 percent over the prior-year period. November front-end same store sales decreased 0.5 percent. Pharmacy same store sales, which included an approximate 897 basis points negative impact from new generic introductions, decreased 4.2 percent. Prescription count at comparable stores increased 2.2 percent over the prior-year period. Total drugstore sales for the five-week period decreased 2.3 percent to $2.396 billion compared to $2.452 billion for the same period last year. Prescription sales accounted for 67.6 percent of drugstore sales, and third party prescription sales represented 96.6 percent of pharmacy sales. As anticipated, Hurricane Sandy had a negative impact on same store sales results for the month of November. The Company estimates that November’s front-end same store sales were negatively impacted by 0.4 percent and the month’s prescription count at comparable stores was negatively impacted by 1.5 percent. The management hopes investors will give them a pass because they got hurt by the storm. But this company has been a mess for quite some time and Sandy has little to do with it. 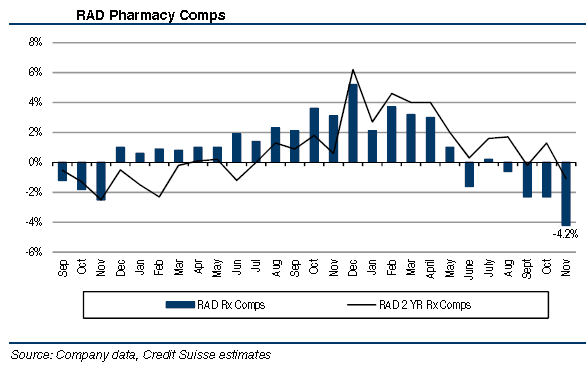 Pharmacy sales comps have been sliding since this summer. And the market can "see through" the "Sandy excuse" for poor results.